​Nick Ryan is a multi-award winning composer, sound designer, artist and audio specialist. He has composed extensively for film and TV drama, documentary, interactive media and orchestral ensemble. 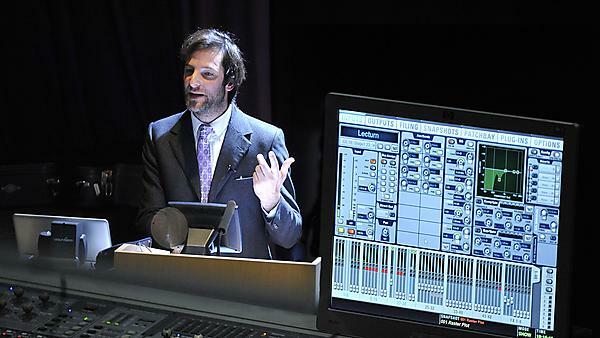 He has been invited to speak on the future of music and sound at venues throughout the world including The MIT Media Lab, The BANFF Centre for the Arts, Screen Australia, TEDx Aldeburgh and The Royal Institution. Nick was the recipient of a BAFTA for technical innovation in 2004 for his interactive BBC radio drama The Dark House and, with colleagues Jane Grant and John Matthias, won the prestigious PRS Foundation New Music Award in 2008 for their sound installation The Fragmented Orchestra. Their subsequent sound piece Plasticity was recently shown at The BFI and Google Campus in London. In July 2012, Nick completed his most recent collaboration with Pascal Theatre Company, The Secret Listeners, a one hour ‘site specific’ performance in Trent Park House, based on transcribed conversations which took place between Nazi Generals who were imprisoned there between 1942 and 1945. Nick Ryan is an Honorary Doctor of Music at University of Plymouth. 'As above, so below' is a composition about my father, Mark Ryan, who was tragically killed in an accident, on a tea plantation, in Kenya, 31 December 1973. He died attempting to rescue a cow that had fallen down a deep hole in the ground. My father climbed after with a rope with which to haul the animal out. But the cow, with its large lungs, had already breathed nearly all the oxygen and my father, in his haste to save it, had forgotten to tie the rope around himself. He could not be rescued in time. Thoughts about my father and Kenya, where he had lived for most of his life, are frequent, rich and vivid in my imagination and accompanied by a deep sense of 'longing' that has always inspired my music. Yet, since I was only six months old when my father died, and therefore have no recollection of him, and also having not revisited Kenya, the relationship I have with my father and Kenya is solely based on the many stories, photographs and anecdotal fragments that my immediate family have shared with me. Only one photograph exists of the two of us together to my knowledge. As I have grown older, and passed the age my father was when he died, I've come to consider that the impression I have of my father, and of Kenya, is, in a sense, 'mythological', despite the genuine depth of emotion I feel, since it is constructed from, notwithstanding their authenticity, selected and subjective viewpoints which are not mine. As they have been the basis upon which I have developed much of my own identity, I seek to demystify these emotions and to create new experiences of my own. This project, which will consist of two halves, is about finding a new tangible connection to my father, and to Kenya, and investigating the difference between imagination and reality. My father was a keen fisherman and he loved the ocean. In the year preceding his death he mentioned, on three occasions, to three separate people, that he wanted to be buried at sea. And so, according to his wishes, he is buried off the coast of Kenya beneath the Indian Ocean. I was initially inspired to write this piece whilst considering this fact. I imagined the surface (or 'meniscus' layer) of water which divides sea from sky and was stuck by the powerful metaphor it provides for the divide between the past and the present, my father and me, and life from death. In the first part of this composition, "Adagio", I call to mind my current and enduring sense of my father and Kenya and combine it, in part, with the trauma of his death, the gaps in my understanding of him and the physical place of his burial. The piece is slow, smudged, romantic, longing, frozen and suspended, just as it is in my imagination. Abrupt changes in timbre represent the emotional and physical differences between the space above and beneath the sea and changes in tempo are conceived as differences in the speed of mechanical transmission of sound in air and water. The melody acts as a messenger between worlds, determined to resolve the discord in both and bring about symmetry between them - "As above, so below". The second part of the composition will be written in December when I visit my father and Kenya for the first time and experience place and person first hand. The complete work will be performed at the Peninsula Arts Contemporary Music Festival in February 2013.